As noted in the introduction, in the first half of 20th century, internal unrest was caused by growing communist factions that eventually took power after WW2 but in the meantime give rise to fragmented and localised postal services. There is broad agreement between Gibbons and Scott on the listings: Manchuria (1927), Sinkiang (1915), Szechwan (1933) and Yunnan (1926) (Gibbons subdivides Manchuria between Kirin & Heilungchangand and a 1946 entry for North-Eastern Provinces, but I will leave the latter to one side for now). 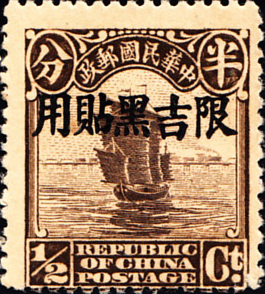 All the issues are overprints with three selling for around $1/20c and Manchuria for $7/70c. After the Russo-Japanese War, Japan took over the lease of Port Arthur and Dairen from Russia and stationed troops in the area to guard the South Manchurian Railway. In 1931 the troops seized the whole of Manchuria and declared it independent as Manchukuo in 1932. At first a state, Pu Yi (the last emperor of China) was appointed Chief Executive and in 1934 enthroned as emperor. 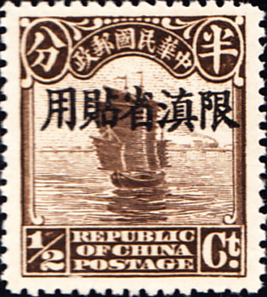 The first issue, depicting the White Pagoda, Liaoyang, has five characters in the top banner reading 'Manchu State Postal Administration', while the 1934 varient with six characters reads 'Manchu Empire Postal Administration'. Gibbons identifies four areas of occupation during WW2. All begin with overprints and that is as far as Kwangtung gets, but the other WW2 entries managed real stamps and those are sought too. 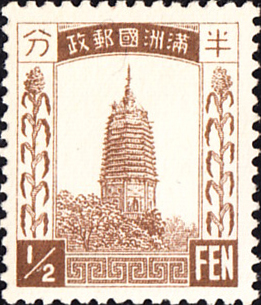 There are numerous local subdivisions for North China, but those are beyond the scope of this exercise: the stamp shown is for ??? (maybe the general issue SG85 Sc8N1). 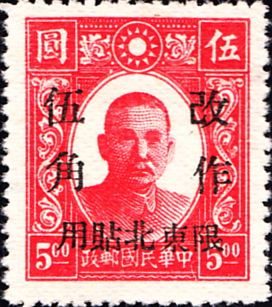 It is difficult to tie up the initial Nanking and Shanghai issues between Gibbons and Scott and so the stamp to be sought and shown has not yet been decided. Scott's sensible positioning of the Northeastern Provinces issues here rather than with the earlier provincials is followed.